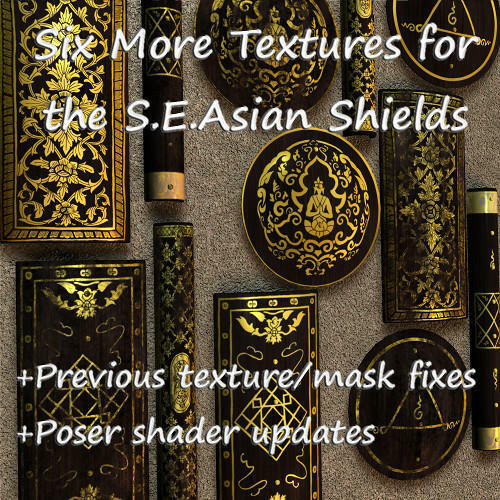 Three 'Smart+' shield props for Poser and DAZ Studio, based on photographs of historical S.E.Asian punch-grip shields from various Thai palaces, temples, museums, and private collections. 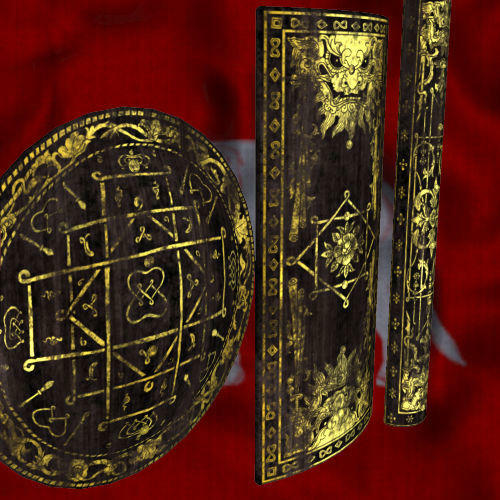 There's a single texture for each shield in both 'new' (as in the main promo) and 'worn' versions. - DAZ Gen 3: Aiko 3, David, Hiro 3, Laura 3, Luke 3, Michael 3, Stephanie Petite 3, The FREAK, The Girl, Victoria 3. - Poser 5: P5 Don, P5 Judy. - Poser 6: P6 James, P6 Jessi, Miki 2. - Poser 7: G2 James, G2 Jessi. - Sixus 1: Behemoth, PH Female, PH Male. - Others: Antonia, Apollo, F202 Dollie, Kirwyn's K, MayaDoll. ...and automatically applies a hand pose to grip the shield! Tested in DAZ Studio 3 and 4, and Poser 6, 8, and 9 on a windows PC. 1) Within the scene select the figure you want to hold the shield (select any body part). 2) Double-click the Poser version of the Smart+ Shield Prop. A dialogue box will appear. 3) Click through the sequence of dialogue boxes that appear, checking that the options are what you want. 4) The shield should now be held firmly in the selected figure's hand. 1) Within the scene select the figure you want to hold the shield (you must select the root node of the figure, and no other nodes must be selected). 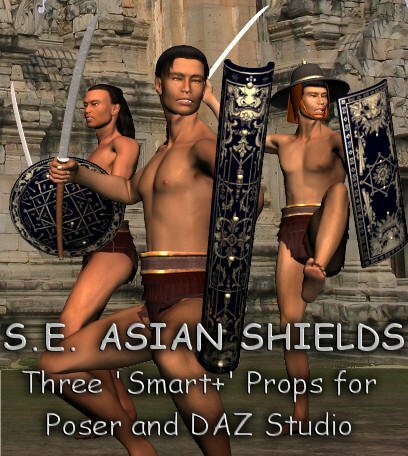 2) Double-click the DAZ Studio version of the Smart+ Shield Prop. The shield prop will appear face down at the origin and a dialogue box will appear. 3) Check that the options in the dialogue box are what you want and then click 'Accept'. By the way, the textures at present are basic diffuse and specular only. 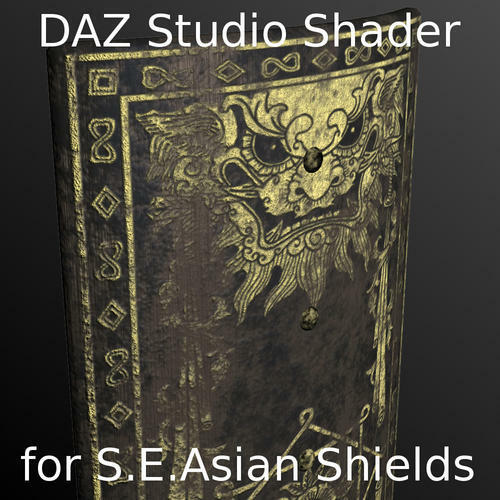 I'm still working on a DAZ Studio 'Simple Dual Material Shader' specifically for this shield, and I'll be releasing it soon, along with a Poser equivalent - fingers crossed! New Poser/DAZ Studio shaders (very basic versions to start with, allowing you to easily change the paint colour and overlay design) going well, along with one additional design for each shield. Upload before the weekend if all goes well. More info plus larger versions of the attached images via the 'Art' and 'Blog' links in my signature. 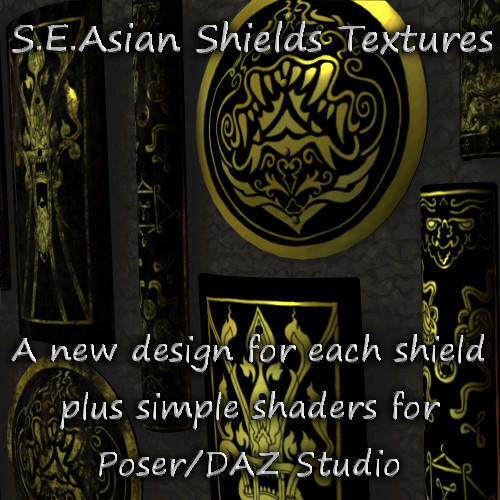 One new design for each shield (both 'new' and 'worn' versions, with Poser and DAZ Studio materials), plus a simple shader (Poser and DAZ Studio versions) that lets you easily change the colours,design, and wear pattern. Thanks Pen - by the way, one of the main goals of that Shader Mixer stuff you helped me get started on was to do a shader for these shields. The shader I've released so far is a very simple version, but I should have a far more flexible one ready for release in the not-too-distant future. There are two new designs for each of the three shields, and there's a 'new' and 'worn' version of each as usual. 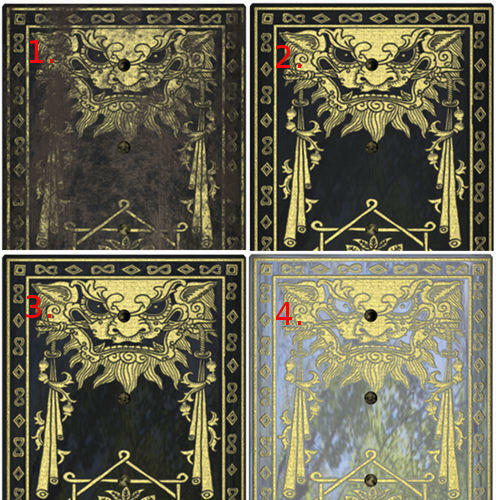 They're the same gold-on-black-on-wood as all the previous designs. But with the 'ShieldTMS(Basic)' shader (DAZ Studio and Poser versions) it's easy to adjust the colours of the three layers (or to use texture images). It's also really easy to use your own design for the shield pattern. These are really nice props. Thank you for all your hard work and generosity. Each shield in this image is the same model with different overlay masks (i.e. 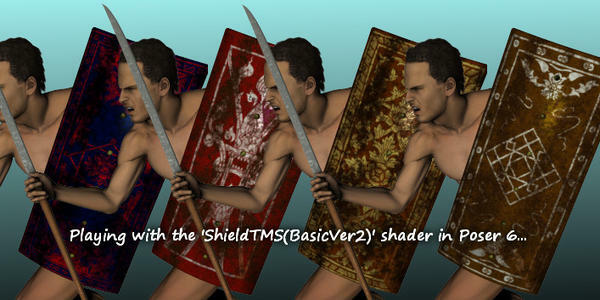 shield designs), different diffuse/specular colours for all three layers, and the same wear pattern mask. I'm quite pleased with how this is going - once I get the reflection and bump added to the shaders I think I'll have reached my goal for this little project. I don't consider this hard work - it's my idea of 'fun'! :cheese: And thanks for the all the feedback, here and elsewhere! 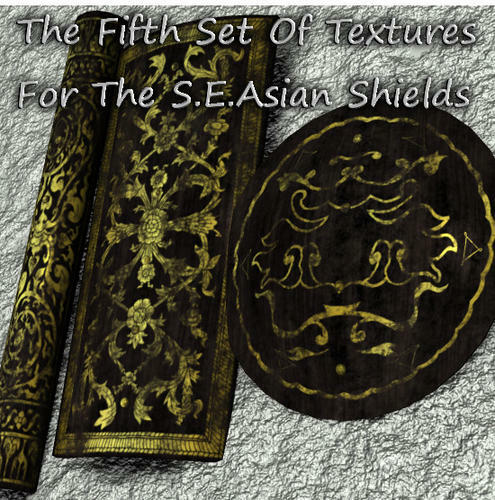 Final batch of textures for these shields available at ShareCG and Renderosity Freestuff - one more texture for each of the three shields ('new' and 'worn' versions as usual, plus the usual masks for use with the shield shader). The majority of my source photos have been used now. I've got a few more photos, mainly of round shields, but they're mostly very small images (as mentioned at the bottom of this blog post) so that's it for now on S.E. Asian shield patterns. 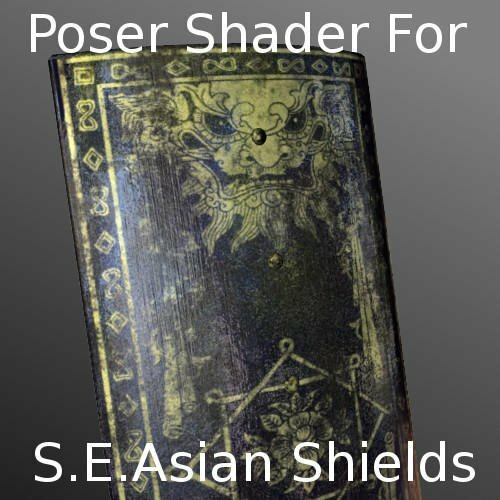 I've got the final version of my Poser shield shader more-or-less ready, so that should be released soon-ish. The DAZ Studio version should follow that. Thanks for the comments - and a Happy Christmas and a Merry New Year to one and all! Completed version of the Poser Triple Material Shader freebie now available from ShareCG or Renderosity Freestuff. You'll probably need to play around on the Advanced tab of the material room to get things looking how you want. The shader network should be pretty intuitive, but there's some hints in the readme. I can add more info on this thread if anybody wants? N.B. These shaders are for POSER ONLY! Tested in Poser 6, 8, and 9 on a Windows 7 PC. P.S. The reflection map image in this package is from www.horo.ch, used with permission. Thanks Horo! ...and finally, got the DAZ Studio version of the shader completed (sort of) and uploaded. It's not quite how I wanted it, but it's good enough for the time being. No real known issues - just didn't get some of the nice features I wanted into it. Available as a freebie at ShareCG and Renderosity Freestuff. Available as a freebie at ShareCG and soon on Renderosity Freestuff with luck. Yes, but the bump/displacement/normalmap (or whatever) seems to provide a 'cleaner' or 'crisper' mesh deformation...looks more like it's actually part of the mesh and not something 'painted' on. I'll give it a spin and see if I can see what happened to the reflections. 1. Loaded the rectangular shield prop into DS4.5, X-rotated it 180° so it's face-up, selected top view and zoomed a bit. No lights in the scene, so DS default lighting. Applied the ShieldTMS(Full).duf. Rendered it. No sign of reflection. 2. Set 'Wear Mask' to 'None'on the surfaces tab (SEAShieldRectangular > Shield > Masks) and re-rendered. You can just make out the reflection if you look very carefully. 3. Set specular strength to 0% (was 50% by default) and reflection strength to 100% (was 50% by default) for the Mid Texture (SEAShieldRectangular > Shield > Mid Texture > Specular/Reflection) and re-rendered. The reflections a little bit easier to spot. Thanks, it's just bump. No normals in this shader (still haven't got the maths sorted!). Per-layer displacement is in the shader, but default settings are zero. It's only per-layer bump that's non-zero for the render (negative for the base (wood) layer, positive for the upper (gold design) layer. Worked out why the reflection isn't showing, but don't really understand the deeper why behind it? Reflections worked fine with a dark mid (paint) layer in the Poser shader, so maybe I'm missing an important difference between DAZ Studio and Poser? First lets forget the ShaderMixer shader and just use the basic reflection parameters on the normal DS UI Surfacess tab. two plane primitives, three cylinder primitives. 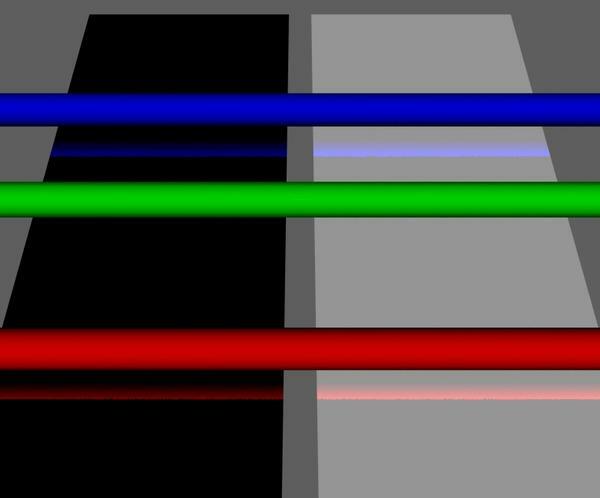 Raytraced reflections and 100% reflection strength on both planes, one plane has diffuse color set to white, the other to black. All other surface parameters on the planes are the same. I tried setting the 'Reflection Color' of both planes to magenta (255,0,255). The red and blue rod reflections are still there, but the green reflection's gone. 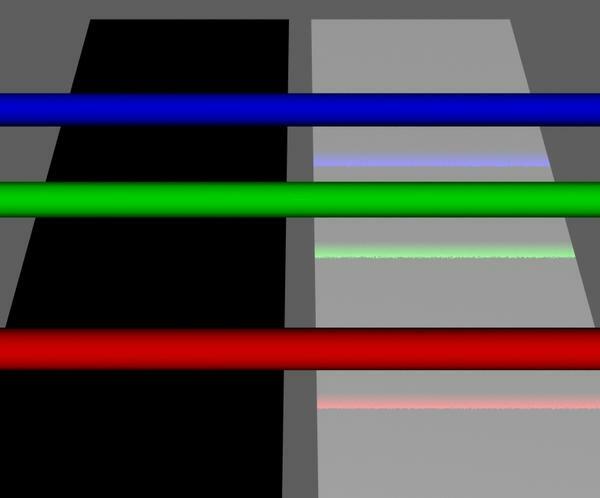 The 'Reflection Color' parameter is NOT an overall background colour that's reflected when the raytracing doen't hit anything. It's more like the colour of a filter applied to any raytraced reflection. 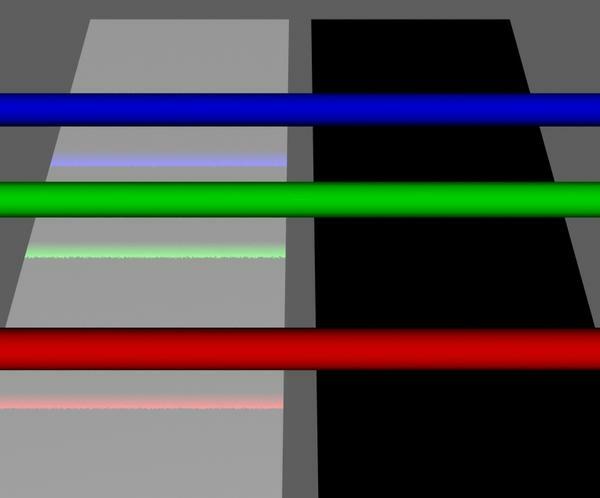 To get a global background reflection you plug an environment map into the 'Reflection Color' channel. Same setup as previous post - I used a test grid (and set Reflection Color' back to white) for both planes. 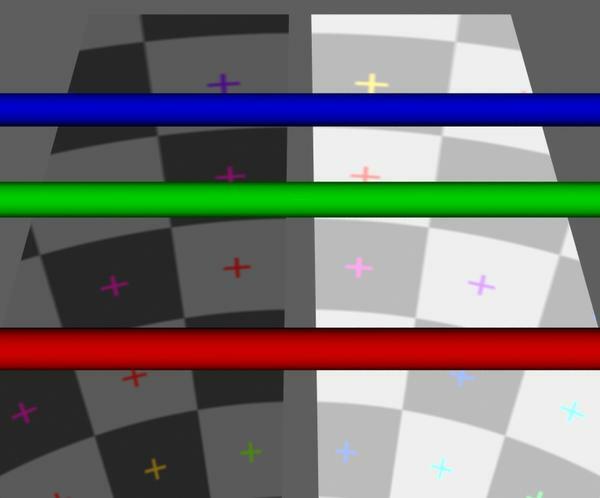 You still see a hint of the diffuse color (left plane is still black, right plane still white), so the 100% reflection strength seems to be almost working as I'd expect. But we've lost the raytraced reflections of the three rods. Iirc the reflection parameters on the basic UI Parameters tab make Ray-traced reflections and Environment mapped reflections mutually exclusive on a single surface. Ah! Now this next test rings a bell. I think there was a separate problem with reflections in ShaderMixer. Same setup as above but I've applied the "DMS(Full)" shader to both planes. I removed the masks (so only the top layers have any effect), set 100% reflection strength, raytraced reflections ('Mapped Or Raytraced' sliders to the far right), no reflection map, white reflection color. Once again the diffuse colors were the only difference. And just to be sure I hadn't got a stray setting in the surface of one of the planes I then changed just the diffuse colours (second image. I've found the comment I was thinking of - it's in September 2012's "Was there ever a non-beta Shader Mixer for DS3A?" thread in the Developer Discussion forum. I mentioned in post #7 of that thread that "...they seem to more-or-less work, except for reflections (don’t know why yet). ", and Rob responded in post #10 there saying that "There are some ray tracing bugs in DAZ Studio 4.5.0.114 that resulted from updating the 3Delight renderer..."
I'd guess that those bugs would've been ironed out by 4.6. So I really need to check again. Suffice to say there's something not quite right with the reflections in the ShaderMixer shader.